Scholarships are a great opportunity for money, and Newfound Regional High School’s guidance department has many local and state scholarships ready for college-bound seniors to fill out and apply for. 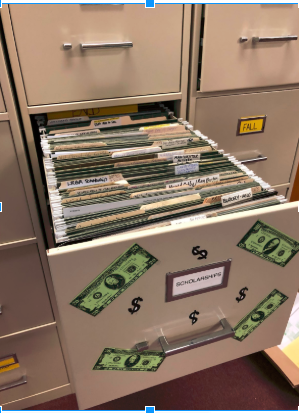 Some scholarship applications are located on the Guidance website, and students can fill out paperwork online, while other scholarships can only be found in the drawer in the guidance office. There are many different types of scholarships for a variety of majors, qualifications (GPA, class rank, ect. ), athletics, and even the amount of community service a student has participated in. Last year, about $80,000 was given out to NRHS seniors in scholarships. One of NRHS’s guidance counselors, Ms. Philbrick, promotes the scholarships with email blasts to the senior class. She says, “Scholarships are important for students because it can fill the gap students have to pay. Usually, parents can only help a little with paying for college..” Philbrick noted that many qualified students do not fill out scholarship applications, and every year there are only a select few individuals who fill them out. Unfortunately, some local scholarships have no Newfound applicants and instead are given to students who attend other schools. Senior Makayla Pixley has filled out at least ten scholarships already, and plans on filling out many more. Her main piece of advice is to finish applications as soon as possible. She understands the importance of scholarships to her own educational plans. “I need the money to help pay for my college,” Pixley explains. “My parents aren’t really helping me pay it, so I have to figure out how to earn the money all on my own.” Guidance has helped Makayla quite a bit with scholarships and deadlines, and she encourages others to fill these out, too. Not only do NRHS students have access to local and state scholarships, there are national ones that can be found online, as well. According to the National Scholarship Database, 60% of deadlines for scholarships are between February and April. There are a myriad of scholarships online, and using websites like scholarships.com can unlock some. Scholarships are extremely important to fill out, don’t take too much effort and time to complete, and they can turn into needed money. Since college is expensive, NRHS students should realize that scholarships are a great way to earn financial help. Juniors should remember to be proactive and go visit guidance for their scholarship opportunities for next year. The scholarship drawer is open to all seniors. College-bound students in the class of 2018, go and fill out some applications!